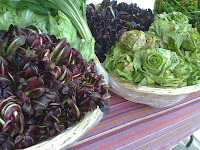 As to those greens, they tasted close to a rabe-like green, although the Asian farmer I bought them from called them sweet mustard. If anyone knows what I can officially call them, please tell me! Then Monday morning rolls around and all of a sudden, everyone is in class. I usually have pretty good attendance, but rarely does everyone make class. Either there was really nothing else to do out there or word got out that we ate some good food. Now, “What are we eating today?” has become the daily greeting, and this week I had to stall them – no cooking really until Thursday due to school testing, but it was a good chance to discuss and visit the farmer’s markets with those who had completed their testing. I used to think the produce this time of year would be like the weather, grey, but the colors we saw were pretty astounding. I had seen castel franco before, but this curly purple treviso…pretty exotic. The oranges practically jumped out at us from across the street. 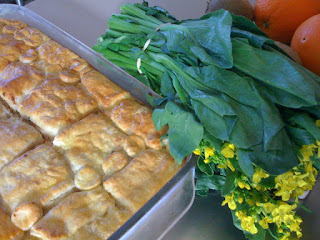 And the rainbow chard and the watermelon radish slices caught our eyes too. One of my favorite things about cooking is that the discovery, it never ends.